Random Year Peace BU Silver Dollar Purchase your random year Peace BU silver dollar at the lowest price online, guaranteed! The Peace silver coin was minted in order to commemorate the cessation of World War I. 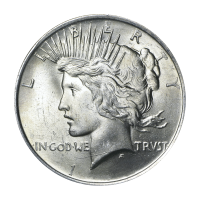 This Peace silver dollar is in Brilliant un-circulated condition, meaning that the coin has maintained it's original luster, and is in near mint condition with the exception of minimal scuff marks. The obverse of this coin displays Anthony di Francisci’s left facing profile of lady liberty donning a radiate crown, the word ‘Liberty’ above and the United States motto ‘In God we trust’, below. The reverse features the symbol of liberty, freedom, and America; the Bald eagle resting on top of a rock, while clutching an olive branch. This is followed by the coins date, which may vary depending on available stock. This coin has mass appeal to collectors and investors alike, due to its brilliant un-circulated designation. Diversify your portfolio with your purchase of Peace BU Silver dollars today!